The theme for this challenge is TRIANGLES! Triangles are popping up everywhere in arrows, chevrons, etc.! You know you can have fun with this theme! For this card, I used a cut file that I made myself:) It's all straight lines, so it was super easy! 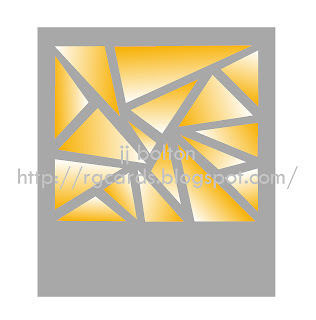 To spice it up a bit I threw in some gold triangles with a variety of bold colors. The triangles are "inlaid" into the frame so that's it's all one layer (the layer itself is popped up on foam tape). I finished it off with a curvy sentiment to contrast all the angles. Click on over to The Cameo Spotlight challenge site to see more challenge Silhouette creations from the TCS DT and our fabulous guest designer, Jin Yong! Then it will be your turn to create your own card or tag and link up:) I hope that all you Cameo owners (even you newbies) jump in! way cool design and love the gray backdrop. You're killin' me with the gold foil. Love, love, love. So cool....I'm coming over for some of that gold foil! Ha! Seriously this card is so hip and modern! Super super trendy triangles! Love it! What a fun card! I love the touch of gold you added! 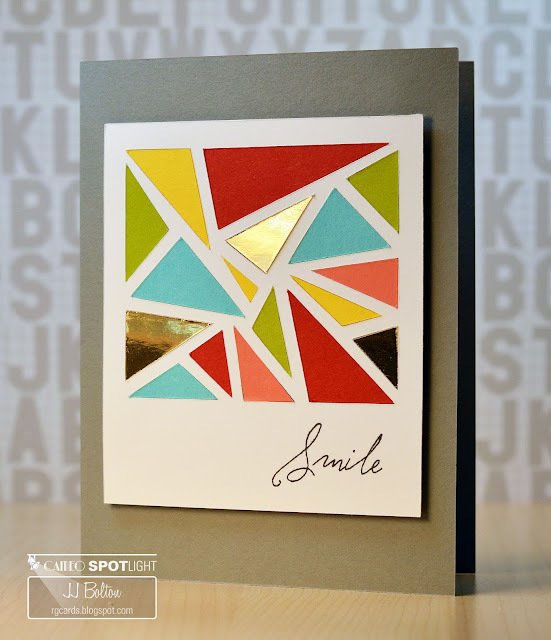 Fantastic card, I love your take with the triangles! A modern BEAUTY! The shapes and colors look great with the gold! Beautiful! The foiled bits add so much to this gorgeous design! That is awesome, JJ! Love that funky design and the gold triangles are the perfect touch. Hope you had a good weekend! I absolutely love your card. Thank you for the file and I am now a follower. JJ - this looks so much like stained glass - love how you've been packing so much color into all your projects (I'm working on one now that reminds me of you) Still trying to talk my DH into a Silhouette for xmas - you are doing some amazing things with yours and I want to play too! What a cool design! Love your card! Amazing, I love it!! I love it so much that I sent a link to your card to a bunch of non-blogging card friends who just got a Cameo. Fantastic, JJ! So glad to finally be catching up with you - I missed visiting you while I was gone! This card is amazing, JJ! Your color combination is fantastic!